Oregon Standoff Second Trial Update | RANGEfire! The Second Oregon Standoff Trial has now gone to the jury — at least the felony conspiracy and firearms charges. Judge Anna Brown refused to allow the jury to hear the subsequent misdemeanor charges, including trespass, so the misdemeanor trial continues, with Judge Brown hearing additional evidence and arguments on the misdemeanor charges, as the jury continues to deliberate the felony charges. Defense lawyers Wednesday vigorously challenged misdemeanor charges against four defendants accused in the takeover of the Malheur National Wildlife Refuge as the judge prodded a prosecutor to make his case against each by citing specific evidence and exhibits. The defense argued that the federal regulation involving trespass at a national wildlife refuge is vague, that defendants never received formal notice they were trespassing and that no evidence exists that the four saw trespassing signs on the property. They also said a white Dodge Durango, a green all-terrain vehicle, an excavator and front-loader that defendants used didn’t have U.S. Fish & Wildlife Service decals on them. Prosecutors countered that the evidence is “overwhelming” and the defense team’s arguments defy common sense. Assistant U.S. Attorney Geoffrey Barrow initially handed the court a chart outlining the charges and allegations against each defendant but the judge wanted more. “It’s not the court’s duty to search for the evidence,” U.S. District Judge Anna J. Brown told Barrow. As a jury began deliberating in the morning on the felony charges against the four refuge occupiers, Brown heard additional testimony and reviewed evidence on the misdemeanor charges against the same defendants. Jason Patrick, Duane Ehmer, Jake Ryan and Darryl Thorn are each charged with trespassing and tampering with government vehicles and equipment. Patrick also is charged with destruction and removal of public property, accused of cutting part of a barbed-wire fence on the refuge property. Ehmer is also charged with removal of government and private property, accused of removing a pouch containing refuge gas cards, an employee’s ID card and cash and checks belonging to the nonprofit Friends of the Malheur National Wildlife Refuge. Brown gave prosecutors until noon Friday to file a supplemental legal memo on its case. She’ll issue her findings and verdicts on the misdemeanors in writing, she said. Her ruling may or may not coincide with the jury’s verdicts on the felony conspiracy, weapons and depredation of government property charges. After they began deliberating, the jurors sent a question to the judge, asking for a transcript of the trial. The judge wrote back that an official transcript isn’t currently available. The federal government lodged the misdemeanor charges against the defendants in late December after last fall’s across-the-board acquittals of occupation leaders Ammon Bundy, his older brother, Ryan Bundy and five co-defendants on felony charges. He also showed a photo of the information kiosk across the street from the main entrance to the refuge, which holds a white sign that lists some of the refuge regulations: “Day use only: The refuge is open daily from sunrise to sunset.” It also cited among the prohibited acts: all-terrain vehicles, fires and camping, “which there clearly was” during the 41-day occupation, Barrow said. He argued that all four defendants were shown in photographs in the refuge bunkhouse, which wasn’t a public area, and several did armed guard duty at the front gate or watchtower. The judge advised Barrow, “You need to be defendant specific,” so the court could make a ruling beyond reasonable doubt. So Barrow showed the court a photo of the firehouse, for example, and pointed to Thorn and Ryan, who were listening to a talk by Ammon Bundy. “It was just not a public area. Their presence there is indicative of trespass,” he said. He reminded the judge of a late Jan. 26, 2016, video in the bunkhouse kitchen, where Patrick, Thorn and Ryan were present. Defense lawyers countered that the government never proved any of the defendants saw the signs presented as evidence. The judge asked the government to file a legal brief by noon Friday to set out the legal standard for trespass before she can rule. Merrithew further argued that Ryan, who arrived at the refuge on Jan. 16, 2016, came after the occupiers already had changed the front sign to Harney County Resource Center and there was no evidence that he or anyone else noticed the information kiosk sign on the other side of the road. Defense lawyers Michele Kohler and Marc Friedman argued there was no evidence that anyone told their clients, Ehmer and Thorn, that they weren’t allowed on the refuge, nor were there trespass signs to suggest that what they were doing was illegal. “There was no notice of trespass that was served on anyone,” Friedman said. With Patrick accused of driving a white Dodge Durango on the refuge property, his lawyer pointed out that the SUV had no license plate and no logo or markings on it to identify it as a government vehicle. Andrew Kohlmetz, Patrick’s standby lawyer, countered, “That’s simply not true.” He added that a number of private vehicles were left at the refuge after the arrests of the occupation leaders on Jan. 26, 2016. “Mr. Patrick was part of the initial team and would have seen all the vehicles that were there and would have seen all the refuge equipment,” Barrow responded. “Yes,” Barrow replied, and moved on. At one point, Barrow slipped and referred to “Finicum’s arrest” during the hearing, and the judge pointed out his error. Occupation spokesman Robert “LaVoy” Finicum was never arrested but fatally shot by state police after he sped away from a stop outside the refuge. Lawyers for Ehmer and Ryan, accused of tampering with a refuge excavator to dig trenches, argued the Caterpillar equipment had no markings. The prosecutor showed a video of it, which provided no further evidence of any refuge or government property insignia. Barrow asked to move on, adding that he would provide further documentation to the court. On another count of tampering with equipment, Thorn is accused of driving a front-end loader on the property. His lawyer argued that the heavy truck was actually a backhoe. “The fact is there was no way an individual could know what was refuge property and what was private property,” Friedman said. Patrick briefly took the stand during the proceeding. When he was sworn in and asked if he’d testify truthfully, he said, “To the point they are allowed in these proceedings, yes.” The judge asked him to answer appropriately. “Yes I will tell the truth,” he said. Patrick said he overheard a conversation between Ammon Bundy and the owner of a property adjoining the refuge. He said he thought the property owner had given his approval to cut part of a barbed-wire fence bordering his property because he planned to put in a gate. Barrow played a video of Patrick cutting part of the fence, and explaining to reporters and others that “some foreign entity .. .just roped off” someone’s property. “I don’t know who put up that fence,” Patrick said. Barrow argued that Patrick’s testimony was false. 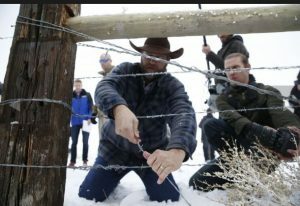 Tim Puckett, the rancher whose cattle graze private rangeland adjoining the refuge, told reporters in January 2016 that he didn’t give Ammon Bundy or anyone permission to enter his ranch to touch the fence. Patrick’s lawyer suggested that “the snipping of one strand of barbed wire” didn’t amount to significant damage. The pouch contained refuge gas cards, an employee’s ID card, cash and checks belonging to the nonprofit Friends of the Malheur National Wildlife Refuge.